Tortuga One, the first Minor League team-branded plane, flies commercially between Daytona Beach and Fort Lauderdale on a daily basis. Turtles can be found on land and at sea. In Daytona Beach, Florida, they're now in the air. The Daytona Tortugas, Class A Advanced affiliate of the Cincinnati Reds, have established a pioneering partnership with Silver Airways. Tortuga One, a 34-seat Saab 340 turbo prop plane, debuted on Jan. 17 and provides daily commercial flights between Daytona Beach and Fort Lauderdale. 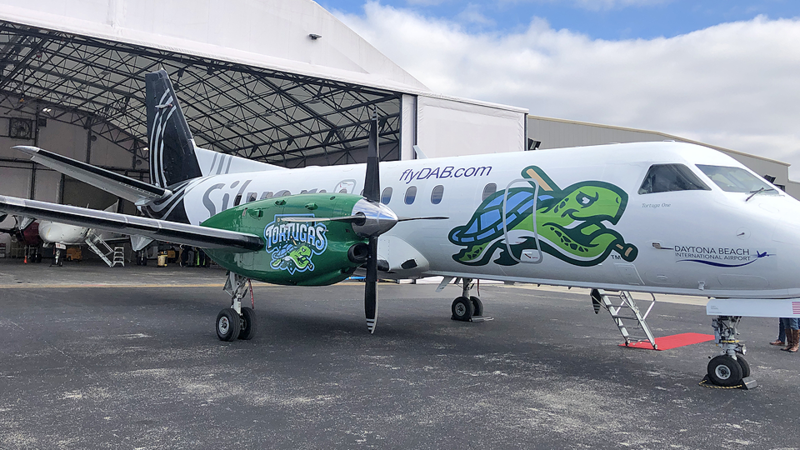 Tortuga One is the first Minor League team-branded plane, representing a new frontier for clubs interested in expanding their presence beyond the ballpark. Headquartered at Fort Lauderdale-Hollywood International Airport (FLL), Silver Airways specializes in in-state routes and flights to the Bahamas. The company began servicing Daytona Beach International Airport (DAB) on Jan. 17, in conjunction with the debut of Tortuga One. "We've always had a good relationship with Daytona Beach International Airport. They've always been a big partner with our club," said Tortugas president Ryan Keur, entering his third season with the team. "We learned that JetBlue was ending its service out of Daytona Beach, so the airport was in discussions with two airlines and one was Silver Airways. ... It was intriguing because [Fort Lauderdale] was the first flight from Daytona Beach going south, so we had conversations with our contacts at the airport. We learned that in their conversations with Silver Airways, [the airline] had expressed a ton of interest in the Tortugas." Silver Airways CEO Steve Rossum said that he and several colleagues already were familiar with -- and fans of -- the Tortugas. They considered the team a crucial component of their upcoming entry into the Daytona Beach market. "We immediately thought, 'How can we get involved in the community?'" Rossum said. "We don't have the ad budget that American and Delta do; we're mom and pop. We try to do things just like the Tortugas. How do you get a lot of attention and interest in the community, but with as few dollars as possible? ... [Tortugas] management is clever and fun but also very professional in how they execute and implement their ideas. "I think association with a Minor League Baseball team makes sense. A lot of pilots come [to Silver Airways], work four or five years and then go to United or Delta. It's almost like we're Double-A, part of a natural career progression." With mutual interest established, the Tortugas and Silver Airways began, as Rossum put it, "talking about cost-effective ways to create a lot of buzz." The idea of a "wrapped airplane," a plane decorated with huge logo decals, emerged quickly. Rossum had held several senior management positions with now-defunct AirTran Airways, which regularly included branded wrapped planes among its fleet. Tortuga One was designed primarily by Steven Ward, a Silver Airways mechanic (and tattoo artist). The entire transformation process was carried out by employees at the airline's maintenance center in Orlando. "We talked [with the Tortugas] about what we had done with other airplanes and started exploring. Their logos and their artwork are great. I love the fierce Tortuga and the novel color scheme," Rossum said of the Studio Simon-created team identity. "[The wrap] is a series of big decals. The vendor that does this works with airplane manufacturers regularly, so there's no degradation of performance on the airplane. No safety issues. It doesn't change its weight. It's a really big sticker that stays on in flight." The plan to debut the plane did hit one small patch of turbulence. "With the government shutdown, the plane almost wasn't approved [by the Federal Aviation Administration] in time," Keur said. "We were prepared to take it out of the hangar in Orlando on Tuesday afternoon [Jan. 15] but didn't get approval until late Monday afternoon. So there was definitely some drama involved in the process." The drama over, Tortuga One is exposing the Tortugas' brand to a wide variety of Sunshine State travelers on the runway and in the skies every day. "The Daytona area is sneaky large, plus there are 10 million [annual] visitors," Rossum said. "There are a lot of people coming through, but you've got to know who you are. We can't be the official airline of the Miami Dolphins. We don't have that reach." The Tortugas also see the partnership as a natural fit. "Tortuga One gets people to Daytona Beach. Now we just have to get them to Jackie Robinson Ballpark," Keur said. "From the fan base side, there are so many local folks who see the Tortugas as affordable family-friendly fun, and that's what [Silver Airways] is preaching, too. ... There was good synergy right away -- our fans being their customers and their customers being our fans." The Tortugas-Silver Airways partnership is very likely a preview of things to come. Rossum said the airline plans to partner with other professional sports teams, while Keur hopes that Minor League clubs will follow the Tortugas' lead. "We announced [the partnership] right before the [Baseball] Winter Meetings, and we had a lot of folks asking questions about how this came about," Keur said. "Hopefully, this led to [Minor League executives] going back to their markets and having conversations with their airport, which could lead to approaching an airline. ... Hopefully, this is proof of concept, taking the brand to so many different places."